This newsletter reports 222 new meteorites from the 2014, 2015 and 2016 ANSMET seasons from Dominion Range (DOM14), Miller Range (MIL15), and Elephant Moraine (EET16). Meteorites include eight CK, seven CM2, one CM1, one CM1/2, two CV3, one EH3, one H impact melt chondrite, as well as three IAB irons, two howardites, one diogenite, one acapulcoite, one winonaite, and one ureilite. The presence of a large L chondrite shower amongst the DOM samples continues (Righter et al., LPSC 2017 abstract # 2396); we are in the process of updating classifications of all DOM equilibrated ordinary chondrites, so those interested in this collection area should be forewarned that the classifications may change in the near future. Many of the Elephant Moraine samples announced here are possibly paired with samples collected in previous seasons and so those interested should consider this carefully. For example, there are previous pairing groups from EET for CK, CM, diogenite, howardite, IAB irons. We will update pairings as necessary as more information becomes available for these samples. When publishing results of your research, please include the split numbers used in the research. We also request that scientists use the following acknowledgement statement when reporting the results of their research in peer reviewed journals: “US Antarctic meteorite samples are recovered by the Antarctic Search for Meteorites (ANSMET) program which has been funded by NSF and NASA, and characterized and curated by the Department of Mineral Sciences of the Smithsonian Institution and Astromaterials Curation Office at NASA Johnson Space Center.” Such an acknowledgement will broaden the awareness of the funding mechanisms that make this program and these samples possible. We suggest you find out how to acknowledge samples received from all the collections/museums from which you have received materials so that all the institutions making samples available to you receive proper credit and acknowledgement. This season's ANSMET field plan is basically a "re-do" of last year's. Last year our plans changed drastically just before the start of the season due to severe logistical constraints. The US Antarctic Program (USAP) had been planning for years to set up the Shackleton Glacier (SHG) camp, a temporary logistics hub in a part of the southern Transantarctic Mountains that is otherwise difficult to reach, to support a wide range of science projects. We had hoped to use the enhanced local air support provided by SHG to operate two four-person teams in the area; one dedicated to systematic recoveries and one conducting reconnaissance. Unfortunately, after SHG was successfully established, a shortage of operational cargo aircraft and a resulting lack of fuel at SHG squashed our plans as well as those of many other teams. After quickly shuffling through many possible alternative plans, we opted to send one team to conduct systematic recovery of meteorites in the Elephant Moraine (EET) icefields for a shortened season. Target icefields for the 2017-18 field season. The red triangle shows the location of the Shackleton camp. ANSMET team A will systematically search at the icefields around Mts. Cecily / Raymond / Emily, while team B will conduct reconnaissance further south, among the icefields in the headwaters region of the Amundsen Glacier. Given reassurances from the US Antarctic program, we are going to give working out of SHG another shot for the 2017-2018 field season. Our plan once again calls for eight persons to deploy to the SHG camp in mid-December. The eight will then split into two teams of four that will perform meteorite search and recovery at separate sites near SHG. "Team A", led by Jim Karner, will conduct season-long systematic recoveries at the icefields around Mt. Cecily, Mt. Raymond and Mt. Emily. This is a beautiful site in the Grosvenor Mts. that was first explored in 1985 and revisited about a decade later (one of the homes of GRO meteorites). Team A will work at these icefields for the entire season (about six weeks), and weather allowing, may finish recovery efforts in the area. "Team B", led by John Schutt, is dedicated to reconnaissance. There are several interesting icefields in the headwaters region of the Amundsen Glacier, only one of which has been previously visited (Mt. Wisting/Mt. Prestrud, where 26 meteorites were recovered in a few days in 1995). 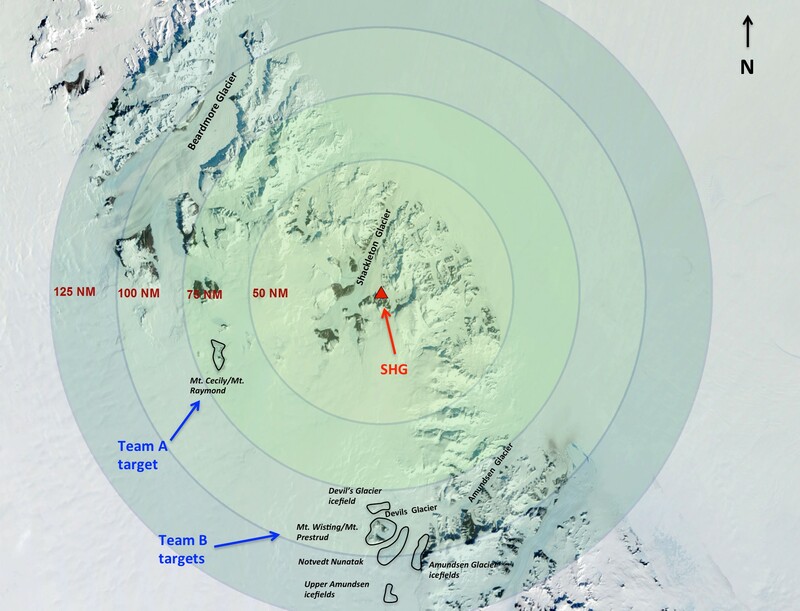 Team B will revisit that icefield and make first visits at several others on or near the Amundsen Glacier, Nodvedt Nunatak, and other sites in the region. This should included a few one-day helicopter visits, logistics-permitting. The main goal for Team B is to get boots on the ground at these sites and provide a good understanding of the potential of each for future recoveries. This kind of reconnaissance is essential to ANSMET - not only does it (hopefully) discover new meteorite concentrations, it aids the prioritization of future work and maximizes associated recoveries for the planetary materials community. In programmatic news, ANSMET has been successfully funded for the next five years, which will take us through mid-2022, with yearly deployments of field teams as in the past (Woohoo!). We now fall under the aegis of Planetary Defense as part of the Near Earth Object Observatories program (arguably "observing" the "nearest" of said objects). This provides very welcome stability after several years of uncertainty in funding, and should ensure uninterrupted recoveries assuming aircraft and fuel are available, of course. The new electron microprobe (JEOL 8530F+ Hyperprobe) at the Smithsonian Institution. Things are rolling along in the Division of Meteorites at the Smithsonian. Our new instrument is officially up and running! We are pleased to report that we have completed the installation and testing of our new electron microprobe (a JEOL JXA 8530f+ Hyperprobe) and we signed off on it in May. It will be used to classify the Antarctic Meteorites and will provide us with state of the art capabilities to do so. 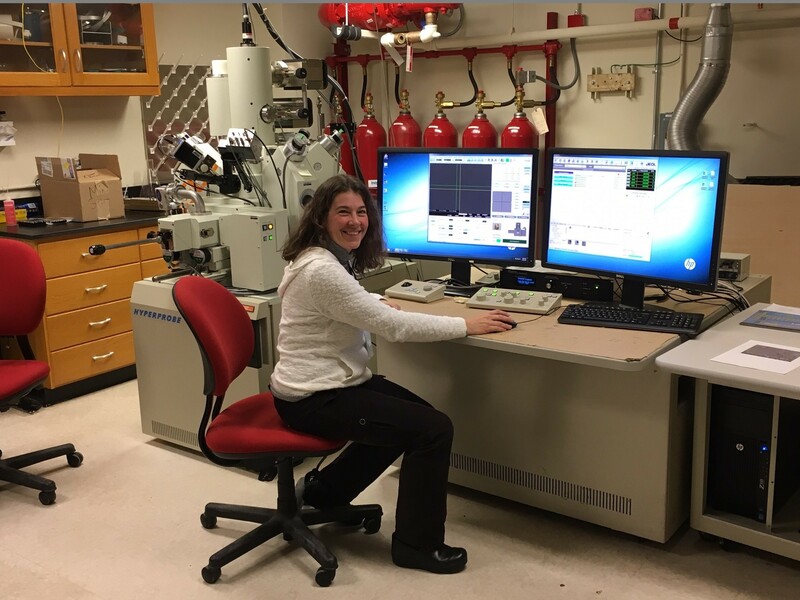 Our hopes from the Spring 2017 newsletter that all of the microprobe analyses in the Fall newsletter might come to you from the new instrument have been fulfilled. Here we report compositional data on about 50 new meteorite thin sections obtained using the new instrument. It was a pleasure putting together that portion of this newsletter (despite the struggles due to our learning curve)! Many thanks to our volunteers, Doug Ross and recent Beloit College geology graduate/new volunteer Alex Venzke for their assistance with this newsletter.